Since the days of Woodstock, attending summer music festivals has been and continues to be one of America’s favorite summer activities. Every year a new summer music festival is added to the fabulous list around the country. Haven’t chosen your summer music festival yet? Elle Magazine has put together a great list of festivals around the country. This year at most of the summer festivals you find the hottest bands- think The Weekend, Muse, Chance the Rapper, etc. You’ll also find, as you do every year, very big crowds of smelly people- young and old. In fact, you can find KJB Security’s very own president and her family at the Bonaroo Music Festival just outside of Nashville almost every year! At KJB Security, Inc., our focus is alway on helping you protect what matters and keeping you KJB Safe! So we’ve come up with a few tips to help you or your loved one stay safe at summer festivals! Stay safe by knowing your locations. There are a few important locations that you should figure out as soon as you arrive and get set up. The first is a spot that is easy to find in case your group gets separated. The best place would be a landmark that can be seen from anywhere in the area. The second is the location of the medical tent in case of emergency! In general, it’s a good idea for you and your friends to be aware of your surroundings at all times. Send your teen or college student off to the summer music festival this year with our iTrail GPS tracking device. Our iTrail Solo has a 14 hour battery life and can easily fit into your purse or backpack. You will receive location updates every 30 or 60 seconds. The best part? You can know when your tracker has left a specified area using our GeoFence alerts sent to your device! Having a friend with you at all times will help you stay safe. It will also increase the likelihood of finding your way back to your tent or home base if you get lost! There are so many potential issues you can run into at summer festivals. Your friends can help keep you out of trouble and into having fun! Stay safe by staying healthy! There are just a few things to remember to stay safe in the hot summer sun at an outdoor festival. Don’t over do it on the alcohol! Body Cameras and Law Enforcement. What Police Stations Need to Know. In a sample of police departments surveyed in 2013, approximately 75 percent of them reported that they did not use body-worn cameras. The survey was funded by the Office of Community Oriented Policing Services and conducted by the Police Executive Research Forum (PERF). PERF’s report about the survey notes a number of perceived benefits for using body-worn cameras, including better evidence documentation and increased accountability and transparency. But the report also notes many other factors that law enforcement executives must consider, such as privacy issues, officer and community concerns, data retention and public disclosure policies, and financial considerations. The costs of implementing body-worn cameras include not only the cost of the cameras, but also of any ancillary equipment (e.g., tablets that let officers tag data in the field), data storage and management, training, administration, and disclosure. To date, little research is available to help law enforcement executives decide whether and how to implement the use of body-worn cameras in their departments. NIJ is currently funding two studies — a CNA Corporation study of the impact of body-worn cameras in the Las Vegas Metro Police Department and a Los Angeles Police Foundation evaluation of body-worn video technology in the Los Angeles Police Department. 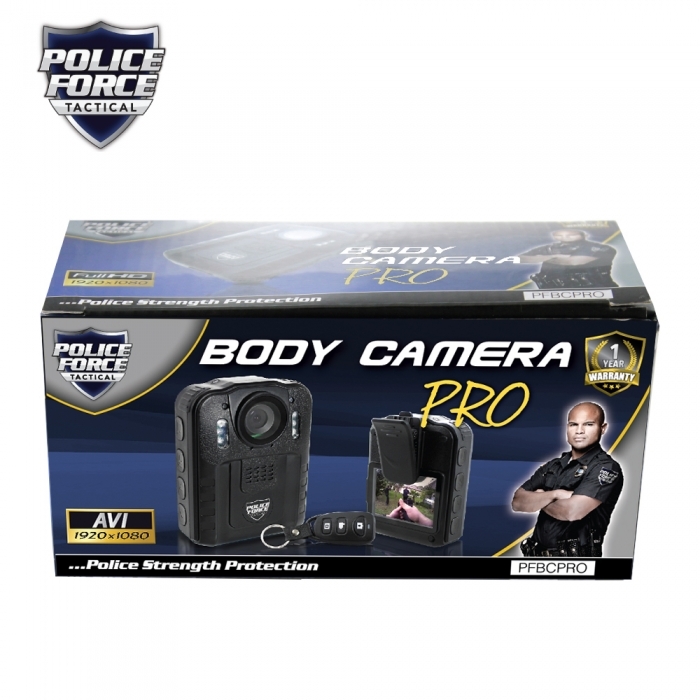 Additionally, through the National Law Enforcement and Corrections Technology Center (NLECTC) system, NIJ funded the development of a primer on body-worn cameras for law enforcement and a market survey of camera systems. Research on the Impact of Technology on Policing Strategies. In 2013, NIJ funded CNA Corporation to examine the impact of body-worn cameras in the Las Vegas Metro Police Department. Researchers will study the implementation of body-worn cameras in the department, including adherence to department policy and the effect of sergeants on patrol officers’ use of body-worn cameras. Researchers also will study the use of body-worn cameras by 400 officers in the field to learn about the effect of body-worn cameras in police-citizen encounters, including measures of use of force. Finally, the researchers will conduct a cost-benefit analysis to estimate the time officers spend in court or on suspension as a result of negative interactions with citizens. Among the sources of data that researchers will use are information on citizen complaints, use of force and crime. They also will conduct interviews and surveys with officers and interviews with citizens. Developed by the NIJ-funded NLECTC Sensor, Surveillance and Biometric Technologies Center of Excellence, A Primer on Body-Worn Cameras for Law Enforcement provides an introduction to body-worn camera systems. The 2012 report discusses the functions and features of body-worn camera systems and highlights issues and factors that law enforcement organizations should consider before and during implementation. Agencies should consider how body worn cameras will meet their mission needs and requirements prior to procurement and use of the technology. To provide general guidance to law enforcement practitioners, NIJ, NIST and the FBI developed a table listing operating characteristics and associated functionality descriptions based on existing technical resources about criminal justice use of video., The operating characteristics and associated functionality descriptions in the table can help agencies determine what they need as they consider the commercial products available. The NIJ-funded NLECTC Sensor, Surveillance and Biometric Technologies Center of Excellence conducted a market survey on body-worn cameras for criminal justice. The survey, published in 2014, aggregates and summarizes information on a number of makes and models of body-worn cameras available today, including the approximate costs of each unit. Wonder Why Everyone Seems to Be Adding GPS Tracking to Their Business Model? Are you looking for a smart way to optimize your deliveries and ensure that your customers are supremely satisfied? Have you ever thought of GPS tracking for your service delivery vehicles? If not, you should. Increased Productivity: Increase the productivity of your drivers. By continuously monitoring your fleet, everyone will be held to the same standards and in return, your employees will be more productive. Lower Insurance: Many insurance companies will lower your insurance premiums if they know you are tracking your assets. Theft Recovery: Means exactly how it sounds. If your vehicle is stolen or lost, you can use the Live GPS Tracker to find its exact location. Tax Write Off: If you have employees that use their own vehicles for deliveries and services, they can keep track of the mileage and use it as a tax write-off at the end of the year! Extend the life of your fleet: By keeping track of your mileage on each vehicle in your fleet, you can in turn, keep track of when the vehicle needs to be maintained. This allows you to extend the life of your fleet, thus saving you money in the long run. If you’re serious about optimizing your sales, increasing employee productivity and providing top-notch customer service, what are you waiting for? Which Hidden Cameras are Better. P2P and P2I? P2P VS P2I. What’s The Difference? 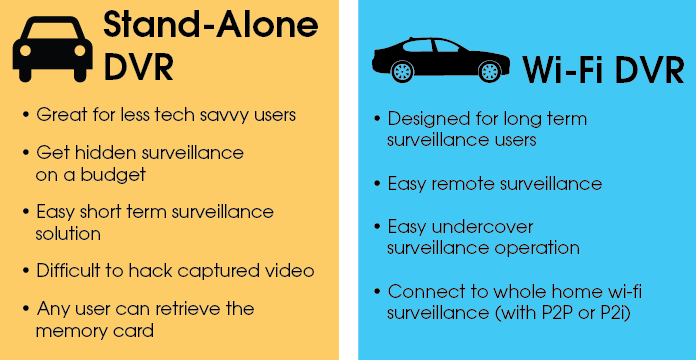 Wi-fi hidden cameras come with two options for their remote connectivity: peer to peer (referred to as P2P) and peer to internet (referred to as P2I.) Let’s dive a little deeper into these two kind of wi-fi connections. For Peer to Peer there is no internet protocol (IP) channeling the data between your hidden camera and the viewing device. The hidden camera itself acts as a wi-fi transmitter and sends live video to your phone as long as it’s within range of the camera. • Makes setting up the hidden camera easy, just check your smart device to see what the camera sees. • No need to access your IP address. • No connection over the internet means your video is more secure. • Less remote capability as the video will stream only when your smart phone is in range of the camera. For Peer to Internet the user connects a smart phone to the hidden camera through a router and network SSID. Add the app to as many devices as necessary so that more than one person can monitor the video feed. Users with long term hidden surveillance needs can really benefit from a Peer to Internet connection. • Very little limitation to remote access of the data. • Set-up is more complicated as access to the user’s IP settings is necessary. • Bandwidth is a consideration as narrow bandwidth, or several devices using the same router, can affect the video’s clarity.Our SleuthGear Zone Shield and Xtreme Life Wi-Fi Hidden cameras offer both P2P and P2I connections and our technicians are ready to handle any tech difficulties that arise after your purchase. Just send us an email with any questions you may have. What is The Best Hidden Camera to Buy? Which is Better? Wi-Fi Streaming Technology That’s Viewable in Realtime, or Standalone Hidden Cameras That Record to an SD Card? Having been in the business of hidden surveillance for some time we have seen a huge rise in wi-fi devices using apps that allow users to stream the feed from their hidden cameras. At the same time there has been a decline in demand for the traditional stand-alone devices that record captured video to a memory card for later review. Wi-fi technology (sometimes, and not always correctly, referred to as the internet of things) certainly seems convenient and flashy but sometimes value is in the eye of the beholder. Do stand-alone DVRs still have a place in the market and in homes? Let’s talk about a few of the pros and cons of each while determining how to spend that hard earned money. 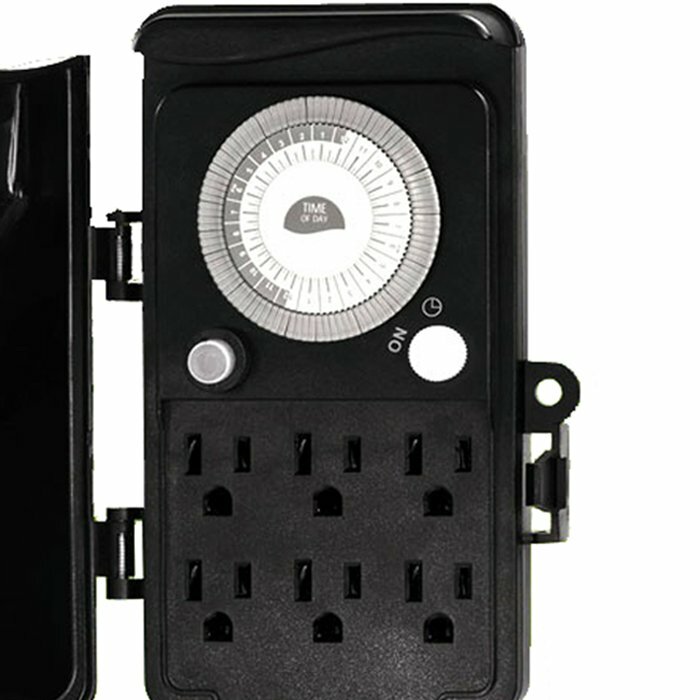 Our battery powered stand-alone hidden cameras and AC powered hidden DVRs have been used reliably for over a decade. Its set-up is relatively simple, a few clicks with the included remote sets time and date, motion activation preferences, recording time. Simply remove the memory card, pop it into your computer and review your captured video as easily as surfing social media. If we’re making comparisons this hidden camera DVR is the 1989 Chrysler LeBaron that your parents let you drive in high school. Sure it’s a bit stripped down but it won’t leave you stranded wondering what your teenagers are doing down in the basement. And speaking of teenagers in the basement, this DVR is no Snapchat nightmare waiting to happen…. a hidden camera that’s not connected to the internet is almost impossible to hack. Now we all want to grow out of that ’89 LeBaron at some point. And the shiny new Acura bought with our first grown-up paycheck sure looks nice sitting in the driveway. But in time we’re bound to find out that all its bells and whistles mean there’s more to maintain. The same principles apply to wi-fi electronics. While we want all our wi-fi gadgets to work without fail, a hidden camera is not an iPhone. For the best user experience we have a couple of suggestions: First, determine if you need Peer to Peer (P2P) or Peer to Internet (P2I) connectivity. Our Zone Shield and Xtreme Life cameras can work with either. For a P2P connection the camera’s own wi-fi module generates a signal that you can stream on an app as long as you’re in range of the camera. It’s great for checking on nap time while trying to get that last little bit of yard work done. For a P2I connection the camera connects through your router using your network SSID just like any home automation device. Our wi-fi hidden cameras do come with 720p resolution but that HD resolution also means they have a pretty hefty appetite for bandwidth when connected via P2I. Think about how many wi-fi devices are plugged in at your house…. tablets, phones, TV receivers? Our wifi module has a strong signal but it’s only as good as your router signal. For the best results we recommend setting the camera to VGA 640×480, the higher the definition the more bandwidth your camera will chew up. Fortunately our Zone Shield and Xtreme Life families have both stand-alone DVRs and wi-fi connected hidden cameras available. Refer to the table below to determine if your hidden surveillance problems can be solved with the hidden camera equivalent of a spiffy Acura or a reliable Chrysler. In a shocking video that was shown to the jury at trial, two nursing home aides appeared to stuff a latex glove into the mouth of a 96-year-old nursing home resident. The resident was sitting in a wheelchair. The undercover video helped change laws in many states. Families can legally hide cameras inside their loved one’s room. New Diversion Safes Available Now! Our diversion safes are popular, everyday products. The companies that manufacturer them are constantly updating their brands which is a great thing. I mean think about it, whose going to have a can of pasta sauce or can of coke from 2010 in their pantry? People want what can be found in stores “today”. Zone Shield Wi-Fi cameras allow easy remote viewing anywhere on the free EZ-See app. Event notifications alert you when the hidden camera has noticed activity at your home or office. Connect multiple cameras and view live streaming video from all devices on your tablet, smart phone or PC. The New Smoke Detector Hidden Camera with Wifi Remote Smart Phone and Internet Viewing Its motion activated sensor springs to life faster than any other covert system so there’s no chance of missing an intruder. Because you never know when someone in your home will harm your family or your property the SleuthGear Xtreme Life is the right product to have if you don’t know when you’ll need it. Up to 30 days of operation in standby mode on a single battery charge. Because it can work without wires, it can be placed anywhere and the PIR (heat sensor) conserves energy so that there is little worry of battery failure. Its Just Like our Xtremelife Version, but Better! Over the past few years, several Wi-Fi enabled overt cameras have entered the market, making DIY home and business surveillance simple and offering greater flexibility over connected homes and businesses without having to enter into long-term contracts and subscription-based services. In fact, we launched our own Wi-Fi home monitoring system in mid-2015. While these cameras are a cost-effective way to monitor what’s happening while you’re away – and can serve as a powerful deterrent for anyone thinking about doing harm to people or property – the mere nature of the cameras being unconcealed may not offer you a complete picture of what’s going on while you’re at work, on vacation, or even while sleeping with night-owl teenagers coming and going. This is where our exclusive, American designed SleuthGear® brand of surveillance cameras comes in. We admit, it has taken us awhile to make our Zone Shield and Xtreme Life lines Wi-Fi enabled, and for good reason. We’ve worked hard to find the right technology to offer you the quality you’ve come to expect of the SleuthGear® brand. We weren’t going to settle for substandard technology and inconsistent performance. That’s why we are especially excited about these line extensions. Our Wi-Fi hidden cameras offer true live view, require no Ethernet plugs and can perform up to 200 feet line of sight (LOS) from the router. Looking To Buy a Night Vision Surveillance Camera Hidden Inside a Smoke Detector? If you are Looking To Buy a Night Vision Surveillance Camera Hidden Inside a Smoke Detector. Look no Further! Its motion activated sensor springs to life faster than any other covert system so there’s no chance of missing an intruder. Because you never know when someone in your home will harm your family or your property the SleuthGear Xtreme Life is the right product to have if you don’t know when you’ll need it. Up to 30 days of operation in standby mode on a single battery charge. Because it can work without wires, it can be placed anywhere and the PIR (heat sensor) conserves energy so that there is little worry of battery failure. Buy a Night Vision Surveillance Camera Hidden Inside a Smoke Detector and See What you have been missing! I am interested in a stun gun for my safety, I have been pushed around and robed once already the second time I might not be so lucky. I will call for some other items as well. I’m looking for a video recording camera to monitor my vehicle when parked and with the engine off. would you please send me a catalog? oh this is really amazing gadget.very useful for me with the kind of work I do. go to have this. I have seen many a products but this one is by far the most realistic and for in particular, use by women – I will talk about this one to collegues in my office. Copyright © 2009-2015 StunGunMikes.com. Your Trusted Online Source for Stun Guns, Surveillance, and Spy Gear. All Rights Reserved.